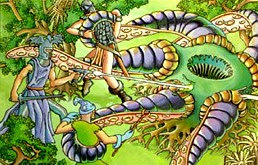 Review Of Black Pudding #1 From Random Order Creations For Labyrinth Lord & your old school campaigns. Black Pudding is a dangerous & brand new 'pay what you want' OSR fanzine for Labyrinth Lord & your old school campaigns. Let's take a look at the contents weirdness that includes black knights, catgirls, chainmail chicks, evil temples, & much more! So whist the OSR continues on its merry way, I've been quietly following the efforts of James V West 's efforts with his gaming & designing over the last couple of years. James is the owner of Random Order Creations the creators of such great OSR adventures such as Howler & Winds of the Ice Forest. Here's the problem there are only so many hours in the day & I've been bogged down with work lately. 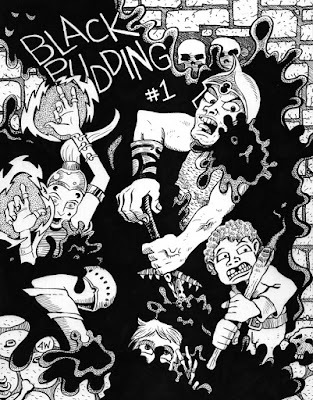 Then across my radar slides 'Black Pudding', this is an OSR fanzine with lots of good solid content and some great artwork. Sure it looks fantastic but is it actually usable for OSR games? In a word, yes! The material is solidly done because the artist/author actually has a firm grasp of the systems he's talking about. The material in Black Pudding is geared for Labyrinth Lord. 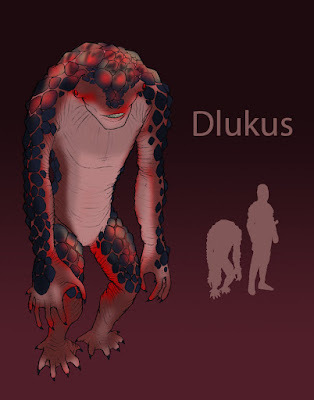 Here's a sample of the type of art, layout, & PC races your going to see. 2 character sheets - Some really nicely drawn character sheets. 7 character classes - These are some great optional PC classes to add into the Labyrinth Lord player's options. These are easily converted to your favorite OSR system. 2 one-page dungeons - To keep things moving for your mini one shot campaigns. Well done and very well balanced. 9 monsters - To challenge even the most experienced players. 8 NPCs - These are great to add into that adventure to hook your players into your next adventure featuring the Black Pudding OSR zine. As a gamer its very exciting to see this level of enthusiasm on the part of a creator & artist who loves the hobby enough to produce this product of his imagination & then release it to the wild. The material is extremely well done & I hope that others will follow in the publisher's foot steps. There's actually enough material here for a mini Labyrinth Lord campaign and several lead ins for other adventures. The material here is top drawer. This is a must for an OSR dungeon master looking to add some quick & very well done sword & sorcery tool kit. Pick this one at all costs! Since this is a 'pay what you want' title then please throw the author a five or two so we can continue to see more top flight Black Pudding issues. Well last night I was speaking with Steve & we began speaking about our trial by fire through the 'S' series of modules for Advanced Dungeons & Dragons. 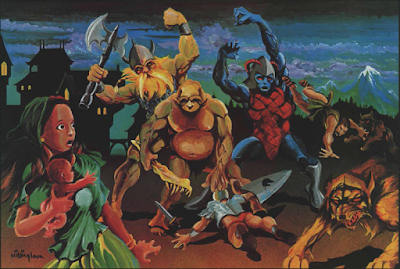 The 'S' series stands for special and these were some of the most memorable of the adventures we played;"other adventures in the S series include S1 Tomb of Horrors, S2 White Plume Mountain, and S4 Lost Caverns of Tsojcanth." But it was 'Expedition To The Barrier Peaks' that slaughtered us time in and out back in the Eighties. For those of you who don't know;"Expedition to the Barrier Peaks was first played at the Origins II convention in 1976, where it was used to introduce Dungeons & Dragons players to the science fiction game Metamorphosis Alpha. 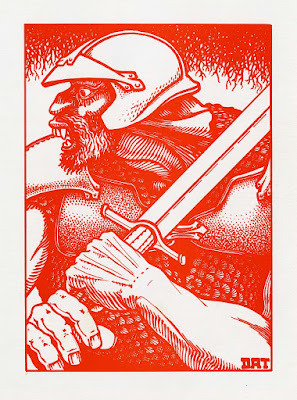 In 1980, TSR published the adventure, updated for first edition Advanced Dungeons & Dragons rules." I've got a long & storied history with this module; it took our AD&D party over to Gamma World through a matter transporter accident (that was Steve's Gamma World campaign so he added in that element). Plus there were a few forays back again not part of the original folks. But last night he sent me this video & it brought back some of the distinct memories of this module. 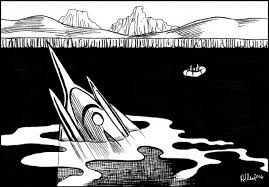 So the basic plot of S3 goes something like this;" It takes place on a downed spaceship; the ship's crew has died of an unspecified disease, but functioning robots and strange creatures still inhabit the ship. The player characters fight monsters and robots, and gather the futuristic weapons and colored access cards that are necessary for advancing the story." "Expedition to the Barrier Peaks's 32-page adventure guide is divided into six sections. These describe the crew's quarters, the lounge area, the gardens and menagerie, and the activity deck. Along the way, the characters find colored access cards and futuristic devices such as blaster rifles and suits of powered armor that they can use to aid their journey. The first two sections involve various monsters, vegepygmys—short humanoid plant creatures—who have commandeered the crew's quarters, and a repair robot that follows instructions before its batteries run out. There is also a medical robot trying in vain to find a cure for the virus that killed the ship's crew. In the lounge area, a "Dining Servo Robot" still works, although the "food" it serves is now moldy poison. The gardens and menagerie area includes an encounter with a "cute little bunnyoid on the stump". :15 It looks like a horned rabbit on a tree stump, but when approached, the stump develops fangs and its roots become tentacles, which it then uses to attack the characters. The next encounter involves a froghemoth, a large alien frog-like creature with tentacles and three eyes on an eyestalk. In the sixth and final section, the activity deck, the players' characters must contend with various sports robots, including a "boxing and wrestling trainer" and a "karate master". :18 If the characters can communicate with the karate master and tell it that boxing is superior to karate, it will attack the boxing robot until both are destroyed, else they will both attack the characters. The last area of the activity deck is the loading area, where the characters can leave the spaceship." The Expedition to the Barrier Peaks takes place around the Grand Duchy of Geoff (which seems to be a happening place in EG's home campaign) which is under constant attack by a succession of monsters that have been emerging from a cave in the mountains. 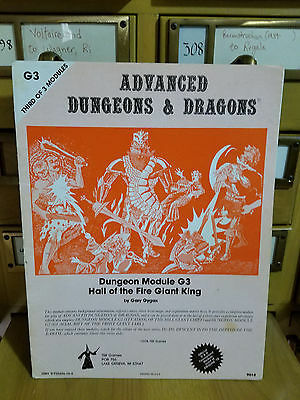 This module can also be used to introduce lots of traditional AD&D elements and bring on the post apocalyptic vibe in spades while turning up the players onto the Metamorphosis Alpha background music. This is an idea that I want to develop further & might mean a much deeper blog entry down the road. Basically S3 is one of the more adaptable of the 'S' series of classic TSR era modules & one of my all time favorites. With a bit of creativity and some willing players it can easily be used as a diverse & deadly module of incredibly epic proporations in your OSR games! I got a chance to sit down with my buddy Steve today & shot the old school bull about last night's events and the G series adventure collection 'Against The Giants'. This is one one hell of a campaign. BTW the players were texting him wanting to know when the next meet up is. 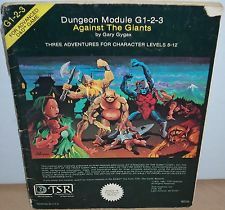 Taken as a whole Against The Giants is one of the classics of Advanced Dungeons & Dragons first edition, that is a spruced up and collected version of the 'G' series of modules for Dungeons and Dragons. 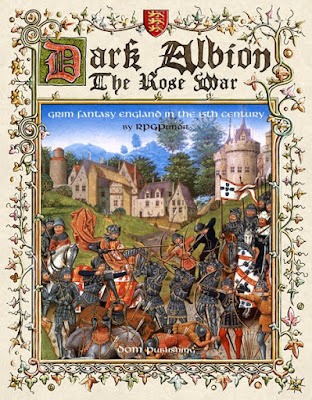 Here all of the action is taking place in the Grand Duchy of Geoff, in the World of Greyhawk. "Against the Giants (G1-2-3): These adventures occur in several different locations throughout Crystalmist Mountains and Jotens. 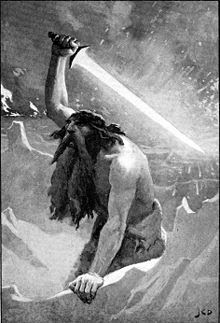 The Steading of the Hill Giant Chief in in hex P5-129; The Glacial Rift of the Frost Giant Jarl is in hex S5-134; and the Hall of the Fire Giant King is in hex M5-138." I'm going to try to keep this overview and commentary short, sweet, and to the point. 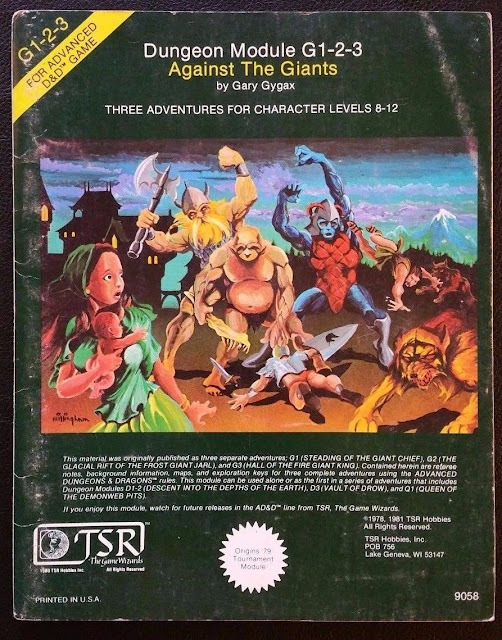 This is a classic is according to Wiki;"Against the Giants is an adventure module written by Gary Gygax and published by TSR in 1981 for the Dungeons & Dragons fantasy role-playing game. 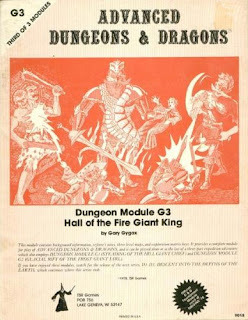 It combines the G series of modules previously published in 1978: Steading of the Hill Giant Chief, Glacial Rift of the Frost Giant Jarl, and Hall of the Fire Giant King. 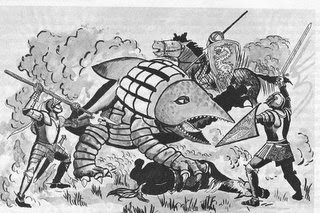 All three were produced for use with the 1st edition Advanced Dungeons & Dragons rules." 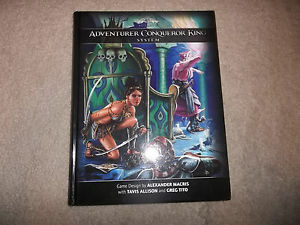 This is one of the classics of AD&D & its for high level PC's and its got a lot going for it. This is one of the modules that has intelligent monsters who are more like NPC's then simple monsters. They have motives, tactics, and can crush PC's like bugs. Taken as a whole as I have over the last two weeks of rereading the originals and the collected modules of G 1-2-3 in action last night I have a very healthy respect of them. The encounters in this collection are classics, the bosses are unexpected & the inclusion of the Drow is a high point for many players. Don't screw with the fire giants or their minions at the end of the module. Tread really carefully but boldly through these adventures. 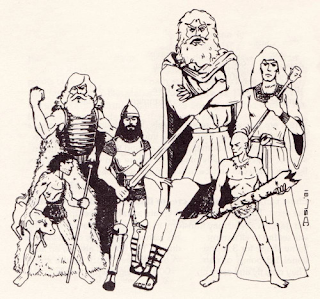 This anthology of the 3 giant modules adds the beloved tournament characters and some nice interior illustrations for the AD&D 1st edition game. This is one of those that you could leaf through & your imagination took over. The lack of hard and fast details allows one to fill in as needed for lots of the interior events of the modules. These are more outline then hard and fast modules because they were created as tournament modules. They do exactly what it says on the tin;"
Giants have been raiding the lands of men in large bands, with giants of different sorts in these marauding groups. Death and destruction have been laid heavily upon every place these monsters have visited. This has caused great anger in high places, for life and property loss means failure of the vows of noble rulers to protect the life and goods of each and every subject - and possible lean times for the rulers as well as the ruled. Therefore, a party of the bravest and most powerful adventurers has been assembled and given the charge to punish the miscreant giants. These adventurers must deliver a sharp check, deal a lesson to the clan of hill giants nearby, or else return and put their heads upon the block for the headsman's axe! Yet this charge is not as harsh as it may seem, for all have been fully equipped with all standard items needed for both wilderness and dungeon exploration; and each member of the party has likewise been given the finest horse available. Guides are available to help, and the leader has a splendid map showing exactly where the great timber fortress of the chief of the hill giants in the area is. This chief, one Nosnra, is a grossly fat and thoroughly despicable creature, sly and vicious, loving ambush and backstabbing. Furthermore, the party has been cautioned to expect a secret force, some motivational power behind this unusual banding of different races of giants. More surprises might be in store . . . Finally, the party has been instructed to keep any and all loot they chance upon, this to be their reward for the perils they are to face. They are to follow any clues discovered if such point towards the sinister hand suspected of guiding the rising, but to return at once if they should determine exactly the reason or force behind the unholy alliance. Some relic of great evil might be at hand." These are classics because of what they do & how they do it; what they do is present a tournament of slaughter level with raid after raid wrapped around clever and very well presented adventure locations. You as the DM have to fill in the rest as needed. This is pretty clever on the part of Gary Earnest Gygax's part as writer and designer. Its a gloriously simple formula that works with one adventure sliding into one and then another wrapped around a plot dovetailed into the back end of Greyhawk. But is this collection a classic because its all about the nostalgia factor? Not quite at all. 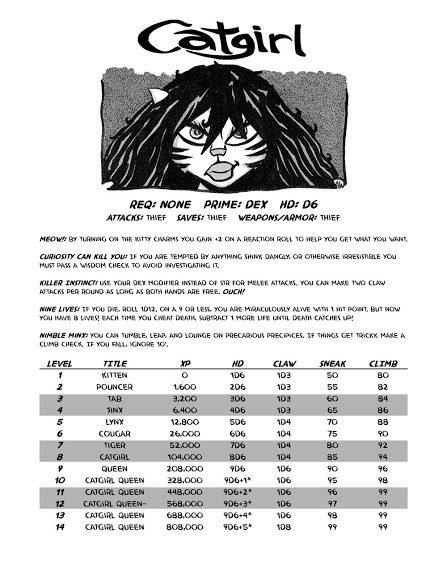 These modules act as a buffer and painful introduction into the world of AD&D 1st edition. I was shown a literal pile of papers today of PC sheets of characters who have died at the hands & claws of the giants,ogres, trolls, etc. over the last couple of years. This is because even though there is a split between the B/X & AD&D 1st edition giants; the giants have always been top tier monsters. The Dungeon of Signs has a great break down of not only the giants but the large humanoid races. And its great little study in the slaughter potential of these nasty pieces of work. 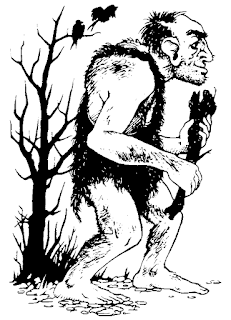 This is a great study of the potential & dangers of using large humanoid monsters. There's lots of neat details that can be gleaned from the author's work here. Is there a heavy nostalgia factor here with these? In a word yes because this series of modules is one where I've had PC's die again and again with lots of fun and somewhat twisted circumstances of death. Last night was revenge for all of those times because one of the players was one of the DM's who used to kill my characters on a regular basis in middle school. Are they classics? In my humble opinion Against The Giants is a great pillar of the AD&D end of the hobby. Now I will move on with my blog, thanks for taking this trip down memory lane with me. Steve you owe me a beer for this one! Keep em rolling folks and I hope you make your save! So for the last two years my buddy Steve has been running an old school Greyhawk/ 1st edition AS&SH Hyperborea mash up game campaign. 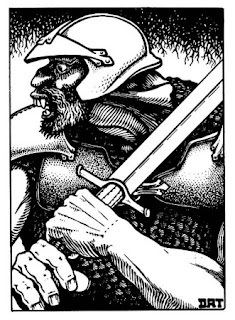 PC's from his AS&SH campaign ended up on Greyhawk & he stuck with the Astonishing Swordsmen & Sorcerers of Hyperborea rpg system. He's been running this game campaign on & off for months when he comes home to take care of his mom. There are eight or nine players & they had unfinished business in the in the Hellfurnaces of Greyhawk (Hex M5-138). They were deep in the adventure while I had talked to Steve about using Surtr (Old Norse "black" or "the swarthy one" as one of the main powers the other being Ymir behind some of the events of the G series of modules. In Hyperborea the Ragnarök prophecies have come to pass with only Ullr having survived the events from Old Earth. We were talking about incorporating the Svartálfar slaves of Snurre into the adventure & various details about treasure, artifacts, etc. They assumed I was beefing up the adventure, nothing could be further from the truth. G3 is a tournament module & its one to be respected by players. There are one hundred and five fire giants, ninety gnolls, fifty two Drow, twenty two hell hounds, twelve fire beetles, ten were rats, six frost giants, four stone giants, & five hill giants. So the party makes it to Snurre, the Fire Giant King, in room 3 of level 1 & get's completely and utterly mopped by the forces they find there. The dice turned against them, the monsters murdered them, & I got the blame. It was glorious to watch, two years worth of campaign play gone in combat & the dice were merciless on the players. Only the bard survived to gather the ashes of three of his companions in little leather pouches. This is going to turn into the a side quest because the players were seething and out for blood! Steve should get a good couple of months out of tonight's events. The fire giants they're the fire Jotun who follow Surtr from Norse mythology and that means that their master is going to try to bring about the end of the gods once again. The bard overheard the fire giants speaking about Surtr's consort Sinmara who was overseeing some of the events at the hall. The bard was able to escape with a ring of teleportation & the entire treasure that the party has gathered is now going to go towards resurrecting three of Steve's player's PC's. They are now bound and determined to to go back to the Hell furnaces and finish what they started! Well I came away from tonight's glorious slaughter with a very healthy renewed respect for the G3 Hall of the Fire Giant King. I've lived in my skin for a very long time & over the years I've thought about the impact of the weirdness of pop culture. How it echoes through society back & forth, take for example 'psychic powers'. When I was a kid back in the Seventies 'psychic powers' seemed to be everywhere from kids movies,comic books, weird phenomenon television shows, and more. Then like everything in time they just seemed to fade away or did they!? With the world tearing itself apart in the Apes timeline its easy to forget that there were factional lines being drawn across society on all levels. 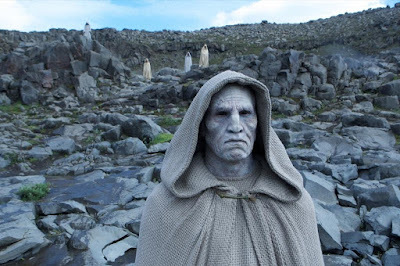 Are the Underdwellers of 'Apes Victorious' simply the descendants of one of those factions or cults of psychic humans? I think so who were being developed, maintained, encouraged by various powers within the United States Government. The Cold War in the Planet Of The Apes was on the boil & the United States government knew it & psychic phenomenon was on the up tick along with it. MK Ultra got unlimited funding. Different factions of psychics were appearing all over the Earth right before the appearance of 'Ape kind'. Hidden psychic communities were beginning to emerge back into the world after decades of being hidden in remote locations. Humanity was at a cross roads & the world's paranormal community sensed it. The next three years saw incredible strides in genetic engineering & the appearance of mutations across the globe. Society seemed to be on the knife's edge, the appearance of psychic powers perhaps gave it a bit of an extra push. The Alpha Omega bomb was only one part of the madness that infected the Apes Earth. We get a taste of this in the Marvel Planet of the Apes magazine which ran from Seventy Four through Seventy Five & featured all kinds of weirdness that was right in line with Goblinoid Games Mutant Future rpg. According to the Planet of The Apes Wiki ;"The new, original stories included in the magazine, written by Doug Moench, were full of wildly imaginative scenarios far beyond what was depicted in the movies or the TV series. In Terror on the Planet of the Apes, for example, the fugitives Jason and Alex had to combat giant mutated river monsters while on their way to confront 'The Inheritors', the society of vaguely-human Mutant Drones controlled by a network of five huge disembodied brains suspended in glass cases. The Inheritors also kept a menagerie of mutated monsters which they used for pit-fighting for their entertainment. The Inheritors had a rival race of mutant human descendants known as 'The Makers'. 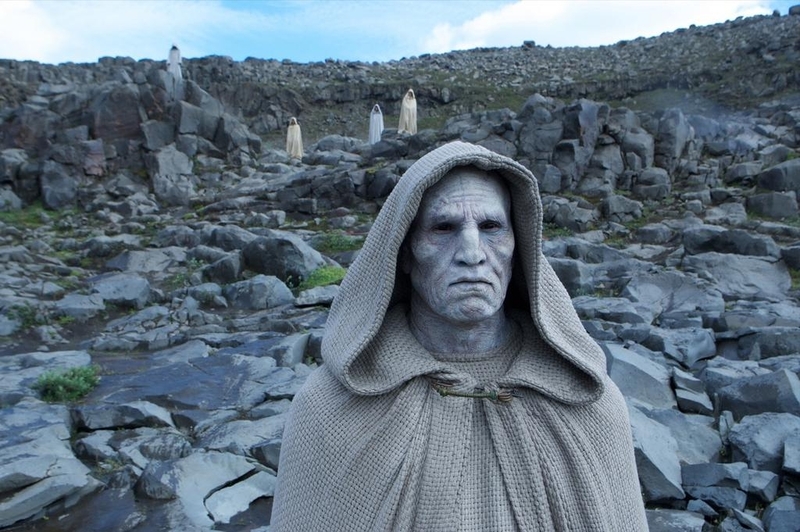 The Makers were slightly more human in appearance, though they were extensively reconstructed with bionic replacement body-parts. They were also more paranoid, and therefore destructive, than the power-hungry but calculating Inheritors. How their races diverged and became sworn enemies is not revealed. A race of Winged Monkey-Demons served the stranded alien 'Keepers' in their vast, buried ship - the 'Psychedrome'. The origin of the Monkey-Demons isn't known, whether they were fellow-aliens or Earthly mutations." So what does this have to do with the Forbidden Zone? What if the reason that all of those space craft & astronauts keep splashing down into the various forbidden zones is that the United States Government of the Apes films were playing around with psychic time travel. Was there a Planet Of The Apes version of 'Eleven' who was opening doors in space and time? Was the Planet Of The Apes version MK Ultra using forbidden Seventies psychic mind retro technology to see through holes in time? Was this to possibly prevent the coming destruction of the Earth? Was this unknown psychic close to ending the Earth themselves? Someone who linked up with various psychics across United States? The planet of the Apes time space continuum is a closed loop with various branches & dead ends. They seem to touch other universes in the various 'forbidden zones' with high areas of radiation. Perhaps because the United States government dropped bombs on U.S. soil along with the Russians to prevent the world falling into the hands of one of the psychic factions or before they could end it!? "When Rod Serling adapted the novel to a screenplay, he first introduced the notion of a radioactive wasteland. This, in turn, would provide a perfect hiding place for the astronauts' advanced technology. 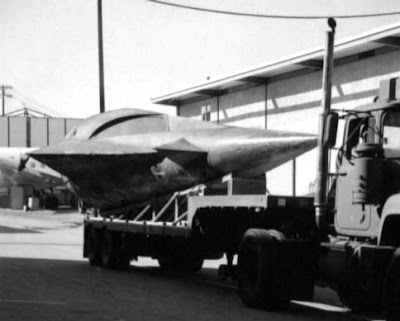 In Serling's draft scripts, the ship automatically touches-down in a valley within a mountain range - hidden even from the watchful helicopters Serling's apes used for transport. The crew travel across a body of water to reach the more promising verdent lands beyond. Later, an ape reporter questions Thomas about the whereabouts of his craft: "We've been told that your ship landed in the Island area which has been quarantined to our race for many centuries." At an ape University, Thomas is told some more about this 'quarantined area' when he asks why the apes inhabit only a tiny part of the land-mass. Dr Ernestine of the Biology Department replies: "Did anyone explain the contamination to you, Mr. Thomas?... Expeditions have been sent out, Mr. Thomas - west on our own continent and to several of the continents beyond. There has been evidence of some form of radio-activity. But of a massive nature... It's mentioned in many of our historical documents. Places where plant life and human life existed in abundance, totally wiped out. So we've been rather cautious in our expeditions beyond." The reason for all this is spelt out to Thomas at the archaeological dig, where a nuclear fallout shelter is unearthed, holding the skeletal remains of advanced human beings. The jungle area the astronauts had crossed to, and where they were captured, was named by Dr. Zira when she asked the hunt-leader, Mr. Digby, about his "expedition into the inner-land." Because the Forbidden Zone map perfectly lines up with modern day New York & New Jersey. But why on Earth would psychics be using their powers to peer into the future or alternative timelines? The answer actually is build right into the Apes Victorious rpg & The Planet of the Apes movie. The answer is FTL travel more importantly hyper-spacial travel; the astronauts in the beginning of 'Planet of the Apes' are engaged in an Einstein space expedition to see if FTL is possible. "George Taylor (Charlton Heston) speaks of how their ship is traveling 700 years into the future but they are not aging. He and three colleagues, fame-seeker Landon (Robert Gunner), man of science Dodge (Jeff Burton), and 'future Eve' Stewart (in what amounts to a cameo role for Dianne Stanley), have been in space for six months, having departed in January 1972. The deep space experiment involves Dr Hasslein's theory in which the astronauts age only a few years while the citizens of Earth age centuries. 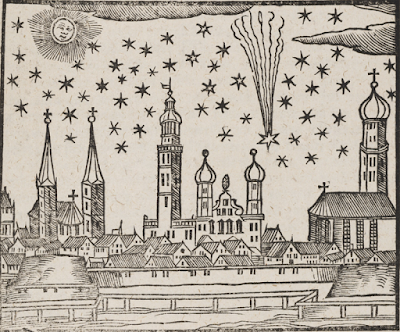 Taylor is floating among the stars and in his self-inflicted malaise wonders if man will ever change. Then he gives himself a sleeper shot and goes into a sleeping chamber like his companions." Since Apes Victorious takes its game ABC's as a homage from Planet of the Apes we can assume that the game's crew is on the cutting edge of '2001 A Space Odyssey' retro technology. So by the time we get to Apes Victorious 'Conquest Of The Planet of the Apes' era it might even be up to the bleeding edge of Logan's Run. This could also lead to some very weird bleed back through time to the Sixties of the Apes Victorious timeline. Imagine being an underdweller child back in the Apes Victorious time line whose been thrown back in time or whose lived in of the alternative futures? 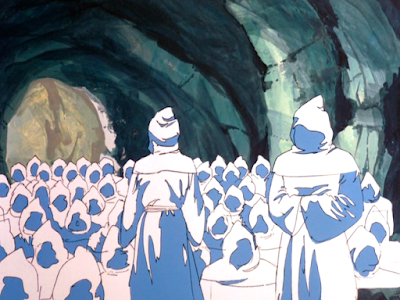 We know that the Planet of the Apes 1975 cartoon had a very different take on the Underdwellers. They were highly advanced & powerfully psychic as well. These might be simply another faction of mutated underdweller psychics within the Apes timeline. Could this time line have dimensional holes in it for PC's to travel through into an alternative hyper spacial realm straight out of Realms of Crawling Chaos? I think so. Given the nature of the 'Forbidden Zones' there might be holes & realms that appear within these zones during times of great electrical or weather related phenomenon perhaps triggered by those psychic events of the past. Kids in the past might have some dangerous encounters with underdweller time travelers who are a part of a secret government enclave who are trying to prevent the future. All of this might have some dire consequences if there are other alternative time lines meet. Of course all of this goes back to the Sixties so who knows what dark & mysterious secrets that the US or the world governments might be hiding. This is the type of a campaign where lies & secrets are going to be stacked & tangled upon one another. 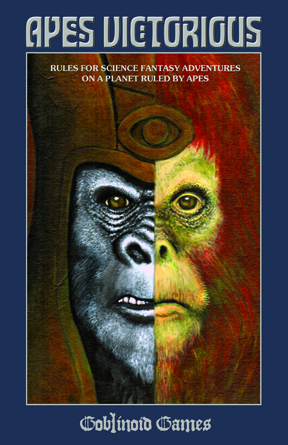 So now the print version of Apes Victorious is on my must get list but its going to be awhile yet. But rest assured it will be mine eventually. This blog entry is neither intended as a violation nor copyright or trademark infringement on Goblinoid Games nor the owners of the Planet of the Apes films, cartoons, or Marvel properties. This blog entry is not intended to violate the copyright nor trade mark of 'The Fury' film nor is it trying to violate the copy right or trade mark of Disney's Escape To Witch Mountain. My apologies to the makers of 'The Stranger Things' television drama, their inclusion is not intended as a copyright or trademark violation. This blog post is for educational & informational purposes only. This blog entry is entirely my writing & ideas, none of the parties mentioned above are responsible for its contents. The writing and ideas are copyrighted to their author. All ideas, materials are intended as parodies of the above films. 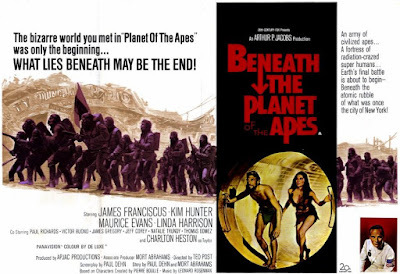 My thanks to the John Kenneth Muir's Reflections on Cult Movies and Classic TV blog & the Planet of the Apes Wiki without whom this blog entry wouldn't have been possible. All contents are copyrighted and trademarked to their respective authors. What To Do If Your Old School Campaign Ends Now!